Samsung Galaxy Ace Plus GT-S7500 is an awesome designed smartphone that has cleverly combined most of the features to provide an extreme performance. Galaxy Ace Plus GT-S7500 runs Android v2.3 (Gingerbread) operating system to deliver a rich user experience. The device is popular bar shaped. Samsung Galaxy Ace Plus GT-S7500 features a 3.65 inch TFT capacitive touchscreen that repeats graphics and images with HVGA resolution of 320 x 480 pixels. The Android based Samsung Galaxy Ace Plus GT-S7500 has a 5 megapixel camera that makes a marvelous visual experience through its impressive visuals. Samsung Galaxy Ace Plus GT-S7500 has also an LED flash with camera which helps to get crystal clear visuals even in low light. Samsung Galaxy Ace Plus GT-S7500 is powered by a Standard 1300 mAh Li-ion battery. Samsung Galaxy Ace Plus GT-S7500 comes with 512 MB RAM and 4 GB of internal memory. These sufficient spaces can help you to store all your important files and data on the phone memory itself. However, you can always expand the memory of this device up to 32 GB with a micro SD card. Samsung Galaxy Ace Plus GT-S7500 has a slim and sleek finish. The backside body is made up shiny plastic. Camera, LED flash and the speaker grill are in the backside of the device. The top side features a 3.5 mm headphone jack and the bottom side houses an USB port and pinhole mic. Power button fixed on the right side. The left side of the device is fitted with the volume rocker. Samsung Galaxy Ace Plus GT-S7500 supports all connectivity options like Bluetooth, GPRS, EDGE, WLAN etc. 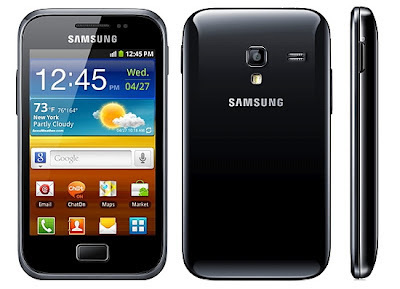 Samsung Galaxy Ace Plus GT-7500 available in Black color.